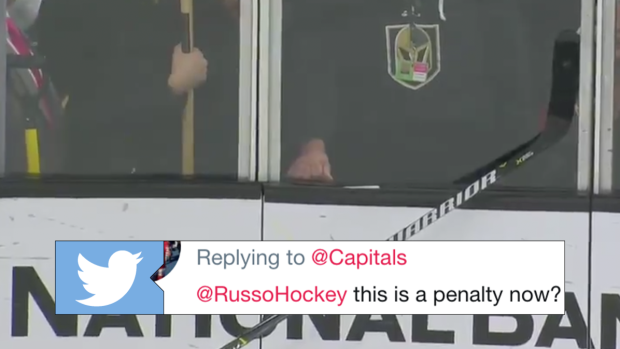 Did you know picking up an opponent's stick and playing with it is a penalty? We all remember the famous clip of Bobby Ryan scoring with Mikko Koivu's stick and he didn't get a penalty for that, but apparently you can get a penalty and we were reminded of that fact Tuesday night. During the Golden Knights and Capitals game, Nick Holden's stick got stuck and Evgeny Kuznetsov didn't have a stick because he dropped his earlier in the shift. Rather than pick up his own stick, Kuznetsov grabbed Holden's and started playing, which resulted in a penalty. Kuznetsov knew he was probably going to get a penalty, but in that situation, you just have to own it and act like you did nothing wrong. @RussoHockey this is a penalty now? Didn't Perry score with Koivu's stick once? I mean...that’s smart of Kuzy but a penalty? Really? You can even see the refs laughing at the end. They find it an absurd reason for a penalty too. The game didn't get much better for Kuznetsov as Fleury did his celebration after Vegas beat Washington.